Passion Quilt Meme: Take Risks! Last week Betha Gutsche tagged me for the “Passion Quilt” Meme. I am finally finding a few minutes to play along. The rules of the meme have already been posted by Pete in his contribution to the “quilt” and since this meme is really making the rounds in libraryland I shall not repost them. Like others who have taken part, I had a really hard time narrowing this down. I waffled back and forth between wanting do something that expressed a concept related to risk-taking or else something on the importance of imagination and creativity in the workplace. Also, I really wanted to use one of several favorite quotations that I have filed on index cards in an old recipe box from my days of being a teacher (we would do the “Thought for the Day” first thing in the mornings and rifling through the recipe box yesterday for this meme was fun). When I found the guinea pig photo, my decision was made. I don’t even particularly like guinea pigs, but this photo was too cute not to use — and I could also relate it to a favorite risk-taking quotation so it was perfect. My explanation of why I chose this particular picture and theme for the meme is really more personal than profound, but still worth sharing (I hope). I left a tenured teaching job where I was earning 40K+ back in the early 1990s to go to library school on what was almost a whim. When I graduated the job offerings for librarians in Canada were slim pickings at best, so I spent the last few dollars in my savings account to attend ALA Annual in NYC to find a job. I did not limit myself geographically and ended up with 5 offers as a result — all in the USA. I emigrated to upstate NY to become an academic librarian and then two years later I took another risk in moving to NJ to become a public librarian (even though I never thought I would leave academia). I was single at the time and knew not a single living soul in either of these places, and it was scary — I almost quit several times to go home to family and friends in Canada. To ease the homesickness (and the boredom of knowing no one), I would take on big projects and just keep pushing myself with new challenges. I would often take on “more than I could chew”, but somehow it would eventually all get done. With each new risk and each new limit tested I finally found myself exactly where I want to be in life (at least for now). I know that there will more big decision in my future and I know that when that happens I will embrace the challenge of a new risk. I honestly had several people question my sanity during some of my riskier moves — after all, who leaves the security of a permanent, well-paying teaching position to take a library job that pays less than 28K in a different country where you know no one? It took several years for me to regain parity with my previous salary, but the non-monetary rewards of my risks and of believing that libraries are the right place for me to work have more than compensated for any lost salary in my journey. Risk-taking is not so scary once you start. In fact, it becomes addictive and opens your mind to greater possibilities. 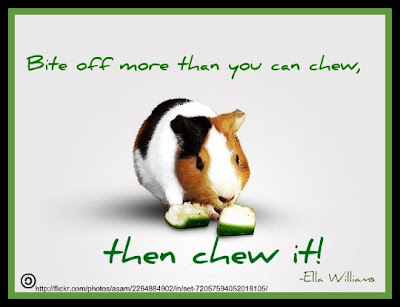 I encourage new grads and seasoned professionals alike to take a great big bite of something new this year and just keep chewing on it until you succeed. Editing to add: I am feeling pretty sure that this meme has just about run its course so I am not going to tag anyone in particular. If you haven’t been tagged yet and want to play along, just saying that Janie from LG tagged you and then have at it. Entry filed under: Memes. Tags: Janie Hermann, passion quilt, risk-taking. Ok, so I feel a bit better about the leap I made/am making! As you know, this graduation thing has me in a funk. I worry I have made a huge mistake to leap out of the safe world of financial analysis Still like you, I feel being a librarian is the best job ever. Your story makes me think that sticking it out a few more months is not crazy and might even pay off in the end. This is a fabulous poster! I think it will become a print on my wall.